You will be picked up from local accommodation in the Rivergum Shuttle Bus between 10.00am - 10.15am and be transported to Banrock Station Wine & Wetland Centre, arriving at approx. 10.45am. Free wine tasting will be available and a complimentary drink of your choice on arrival, overlooking the beautiful wetlands area. Relax and enjoy the morning or go on one of the short self-guided walking trails, designed to suit all fitness levels, which wind their way around the beautifully restored wetlands, mallee and flood plains. Feel free to purchase a sumptuous meal and local ales at the Wine & Wetland Centre before departing on the Rivergum Shuttle Bus at 1.30pm ready to go on our cruise. We depart Banrock Creek riverfront at 2.00pm and cruise downstream on board Qatar where you will see majestic limestone cliffs, wildlife and historic landmarks. Local wines & beers will be available to purchase from our licensed bar along with an assortment of other drinks. 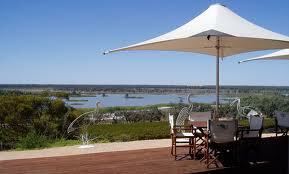 You will disembark at Waikerie riverfront at approx. 6.15pm, ready to be transported in the Rivergum Shuttle Bus back to your accommodation.